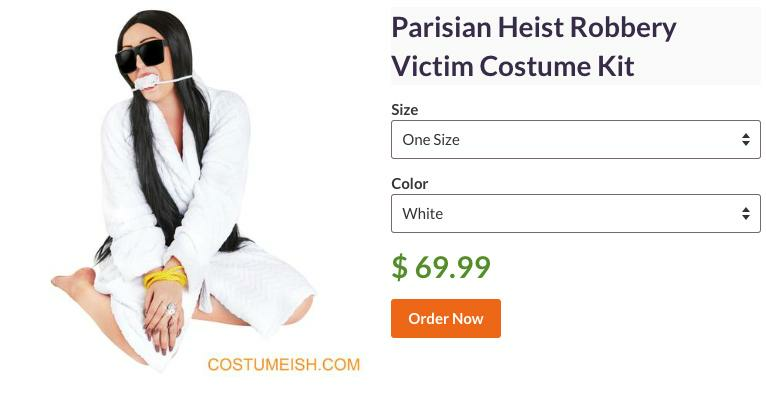 A costume company is now selling a Kim Kardashian Halloween outfit inspired by her recent gunpoint robbery in Paris. US fancy dress makers Costumeish are cashing in on all the controversy surrounding the reality star’s dramatic ordeal, just in time for Halloween. The ‘Parisian Heist Robbery Victim Costume’ is available for $69.99 (£56) and comes complete with a white robe, a black wig, a “$4m dollar ring”, large sunglasses, a fake gag and 2’ of rope. Someone made a 'Kim Kardashian robbery victim' costume for Halloween, I'd like to die and leave this planet for good, now. So horrible that someone would actually make a 'Kim Kardashian Robbery' Halloween costume!